Space shuttle Discovery's STS-133 crew arrives at NASA's Kennedy Space Center on Feb. 20, 2011. From left: Nicole Stott, Michael Barratt, Steve Bowen, Al Drew, Eric Boe and Steven Lindsey. This story was updated at 6:48 p.m. EST. CAPE CANAVERAL, Fla. – The six astronauts who will fly the space shuttle Discovery on its final mission to the International Space Station arrived at NASA's Florida spaceport today (Feb. 20), four days ahead of their historic launch. The crewmembers all touched down here at NASA's Kennedy Space Center by about 3:45 p.m. EST (2045 GMT). 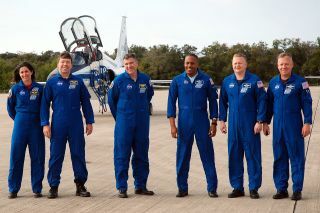 Shuttle commander Steve Lindsey, pilot Eric Boe and mission specialists Michael Barratt, Alvin Drew, Nicole Stott and Steve Bowen flew into Florida on supersonic T-38 jets from the agency's training headquarters at the Johnson Space Center in Houston. NASA administrator Charles Bolden was on hand to greet the astronauts upon their arrival. "We're back here for another attempt at this," Lindsey told reporters who had gathered for the crew's arrival. "We're pretty confident about this one. The external tank problem we've been working for the last several months is probably the most difficult, technical challenge we've faced in recent years. The team did a great job of coming together, figuring out a very difficult engineering problem, and coming up with a solution that I think gives us a really good tank to go launch with this week." Lindsey also spoke about the challenges that have been faced on the crew side – mission specialist Steve Bowen was selected by NASA less than six weeks ago to replace Tim Kopra, who was injured in a bike accident on Jan. 15. "We've had a real challenging training flow to try to bring Steve Bowen in and bring him up to speed to take Tim's place," Lindsey said. "I would like to thank Tim for all that he's done for us. We're all disappointed that he's not going to be here. If it wasn't for Tim developing our EVAs, as our lead spacewalker, and doing a fantastic job with that, as well as doing a great job as flight engineer on the flight deck, we couldn't have pulled this off in four weeks of training and be ready to go. But I'm happy to say our training is complete and we're ready to go." Bowen himself expressed gratitude for Kopra's assistance, and he remained humble about the task of joining the STS-133 crew. "I've got big shoes to fill," Bowen said. "Tim and Al did a great job pulling this all together, well before I got involved. I hope to be able to execute the plan as well as I can, and I'm sure I won't be able to fill it as well as Tim and Al could, but we'll see how this all works out." After several months of delays due to problems with the shuttle's external fuel tank, Discovery is slated to lift off on Thursday (Feb. 24) at 4:50 p.m. EST. (2150 GMT). Space shuttle Discovery stands at Launch Pad 39A at NASA's Kennedy Space Center on Feb. 1, 2011 following its rollout from the Vehicle Assembly Building. The shuttle is due to launch on its final mission on Feb. 24. All six astronauts expressed their eagerness to fly and carry out Discovery's final mission. "Last night, we were able to watch the station pass over Houston. The conditions were perfect," Barratt said. "It's an amazing thing to think that we put that up there, piece by piece – a lot of it from this very place – and that we'll be chasing it down at the end of the week. We're really, really looking forward to that." When the veteran STS-133 astronauts arrived at the Florida launch site today, they landed their T-38 training jets on the same three-mile-long (5-kilometer) runway where Discovery's wheels will roll to a stop for the last time at the conclusion of the upcoming mission. In the days leading up to the launch, the six crewmembers will remain in medical quarantine — standard practice for spaceflyers to help prevent pre-flight illness. They will also spend the next several days reviewing mission details and completing last-minute training exercises. The official countdown for Discovery's launch will begin tomorrow (Feb. 21) at 3 p.m. EST (2000 GMT). Discovery's final flight will be NASA's 133rd shuttle mission. The agency has two more shuttle trips planned before it brings the space shuttle program to an end later this year. NASA's youngest shuttle, Endeavour, is scheduled to launch April 19 on a two-week mission to the International Space Station. The very last shuttle voyage – the STS-135 mission of Atlantis – was approved by Congress in a NASA authorization bill signed by President Obama in October 2010. But funding for the bill is still awaiting appropriations. Last month, NASA set a launch date of June 28 for Atlantis' swan song. The agency is retiring its three remaining space shuttles to make way for a new plan aimed at sending astronauts to visit an asteroid by 2025, and Mars some time in the 2030s. You can follow SPACE.com Staff Writer Denise Chow on Twitter @denisechow as she covers Discovery's final space voyage from Cape Canaveral, Fla.